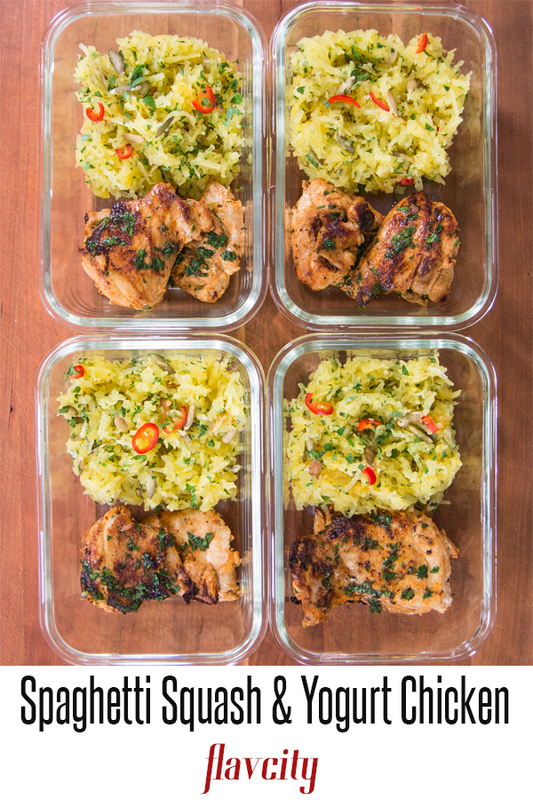 This chicken meal prep recipe has spice crusted and yogurt marinated juicy chicken thighs served with perfectly roasted spaghetti squash tossed with herbs and cheese. 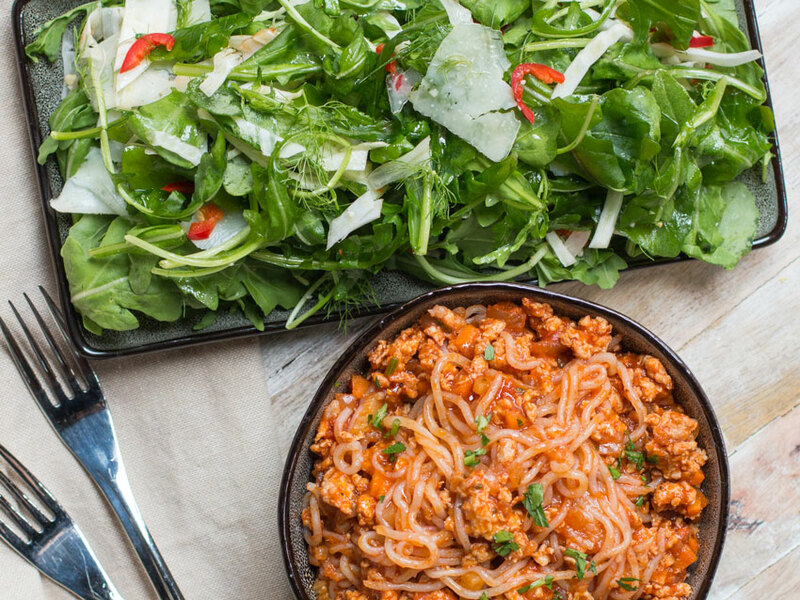 The ultimate make ahead meal plan idea. 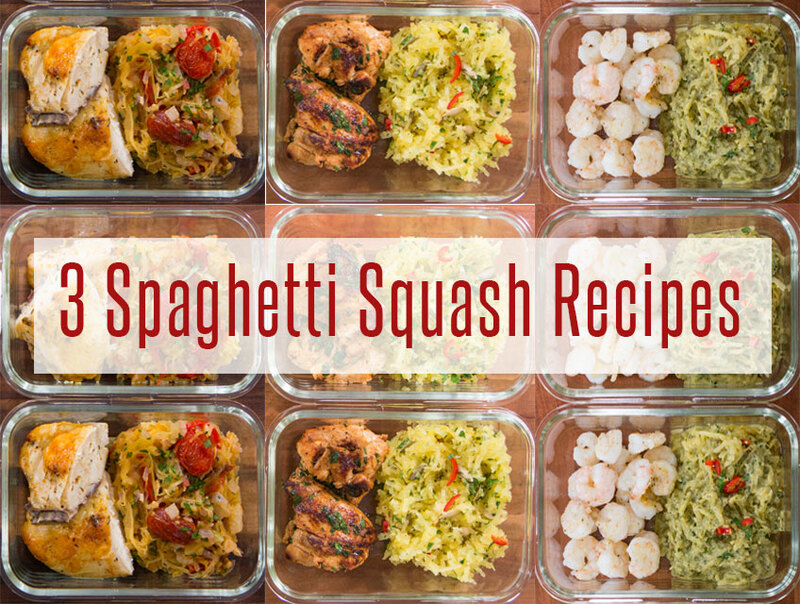 It’s the season for baked spaghetti squash recipes, and luckily I have quite a few healthy meal prep recipes that will hook you up. 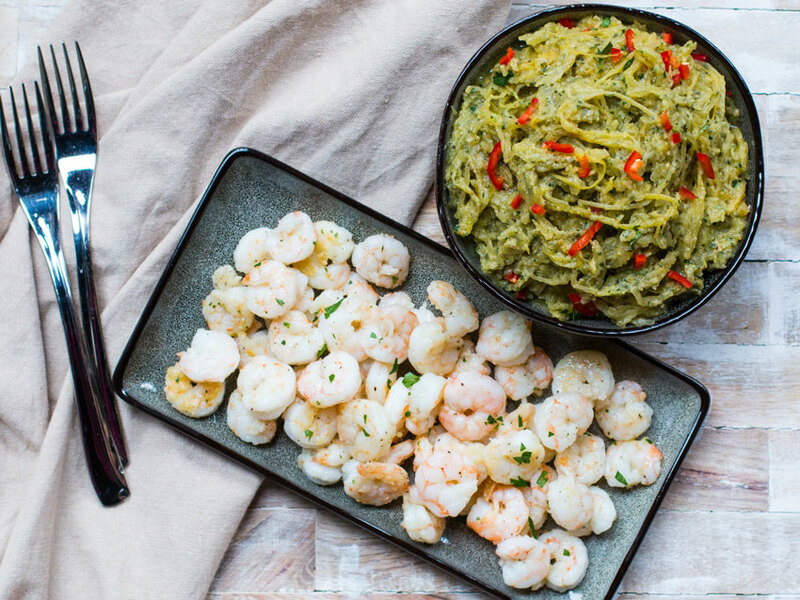 If you are on the keto or low carb diet, then spaghetti squash is the perfect veggie to get your spaghetti on. 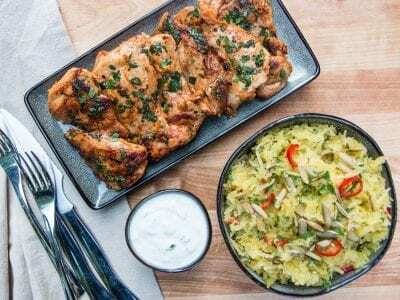 This meal prep recipe has juicy spice crusted chicken thighs marinated in garlic yogurt sauce. I was debating if I should do a wet or dry marinade for the chicken thighs, so I decided to do both! The smoked paprika and cumin add so much flavor to the chicken without adding any additional fat. The yogurt marinade tenderizes the chicken and adds even more flavor, so you end up with a boneless chicken thighs that is huge on flavor. If you are looking for more easy marinated chicken recipes for meal prep, try this fennel spiced chicken thighs recipe and this oven baked BBQ chicken recipe. This meal prep recipe for chicken makes 5 servings for the week. The chicken and spaghetti squash will last for 5 days in the fridge or the chicken thighs can be frozen for 2-3 months. Cooked spaghetti squash can’t be frozen as it will make the texture wet and slimy. You can make this meal prep recipe with boneless chicken breasts if you want. Just make sure not to overcook them. Follow my instructions for cooking a chicken breast like in this recipe for chicken and rice meal prep. Whenever you cook chicken, it needs to sit at room temperature for 20 minutes before hitting the pan or oven. Cold chicken will cook unevenly and be tough. If you are cooking a whole chicken, it needs to sit out for 3o-40minutes to get rid of the chill. 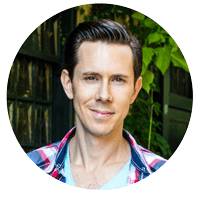 We all know baked spaghetti squash isn’t really your traditional pasta, but it’s great if you are on the keto or low carb diet. Before you start cooking the spaghetti squash, I suggest you first watch my video below to learn how to cut open a spaghetti squash safely. Fingers are soft and squash is hard, so you will lose this battle every time. The safest way to cut a spaghetti squash is to align the knife lengthwise on the squash and use a rolling pin to tap it down, keeping your fingers out of the way. This chicken meal prep recipe has spice crusted and yogurt marinated chicken thighs served with roast spaghetti squash tossed with cheese and herbs. Pre-heat oven to 400 degrees F. Carefully cut the spaghetti squash in half from top to bottom. Watch the video below to see how I SAFELY do this. Scoop out all the seeds and place the squash cut side up on a sheet tray. Season the inside of the squash with 2 total teaspoons of oil, a generous pinch of salt, and a few cracks of pepper. Roast in the oven for 65-75 minutes, or until a small knife can pierce the squash and come out with ease. If it still feels hard or the knife doesn’t come out easily, cook it another 10-15 minutes. Remove from oven and let squash cool down. While the squash is cooking, season the chicken thighs with cumin and smoked paprika on both sides, set aside. Make the yogurt marinade by combining all of the ingredients in a medium size bowl and check for seasoning. The flavor should be bright and tangy from the lemon and have a mild garlic taste, so adjust accordingly. Save ½ cup of marinade to use as a dipping sauce later. Place the spice rubbed chicken in a large zip top bag along with the remaining marinade. Squeeze the air out, and massage the chicken making sure it’s well coated in the marinade. Let sit at room temperature for 20 minutes or refrigerate for up to 2 hours. When time to cook, wipe all of the marinade off the chicken and season both sides with a generous pinch of salt. Pre-heat a large cast iron pan over medium-high heat with 2 teaspoons of oil. Cook half of the chicken in the pan for 5 minutes, flip and cook another 5 minutes. Remove the chicken from the pan repeat this process with the second batch. Once the chicken goes in the pan, don’t touch it until it is time to flip, otherwise you wont get a nice crust. Once the second batch is done, remove from the pan and lower the heat to medium. Add the chicken stock, lemon zest, and juice to the pan and let it cook for 3 minutes. Turn the heat off, add the parsley, and mix well. Pour the pan sauce over the cooked chicken and set aside. To finish the squash, use a fork the pull the squash into strands of spaghetti and place them in a large bowl. To see how to do this, watch the video below. Season the pulled squash with the grated cheese, lemon zest and juice, nuts, herbs, sliced chile, ¼ teaspoon salt, and a few cracks of pepper. Mix very well and check for seasoning. You may need more cheese or lemon juice. Plate the chicken with the squash and use the leftover yogurt as a dipping sauce, enjoy! The chicken and squash will last in the fridge for 5 days or you can freeze the chicken for 2-3 months. The squash will not freeze well, it gets watery and mushy. When time to re-heat, take the lid off the container, cover with tin foil, and reheat in a 400 degree F oven for 10-12 minutes. If re-heating in the microwave, take the lid off, cover with a wet paper towel, and make sure not to re-heat too long or the chicken will dry out. The Spaghetti Squash recipe here has become a staple in my dinners! This recipe with the chicken was AMAZING, and i’ve since had the Spaghetti Squash with turkey meatballs & pasta sauce which was also bomb! Spaghetti Squash is difficult to find in Adelaide, Australia – but if you can find it where you are give it a go and i bet you’ll be hooked!! When you say, “wipe the marinate off,” do you mean like with your hands or paper towel? I did both and neither seem to work well lol. I’m rolling with having a little more marinade and I don’t see how this could turn out bad. Looking forward to it! Forgot to post that this is absolutely 5 stars!! Zahara, so glad to hear it!!! Let me know how it goes! I’ve lots of recipes for chicken or beef here!